newMacgadgets announces the introduction of their new iPad 2 Security Base to their current line of popular iPad 2 Display Docks. The new iPad 2 Security Base is designed for retail and business environments where security is a concern. Apple store look with additional security features. The iPad 2 Security Base is ideal for businesses and companies who use the iPad 2 as a tool to enhance customer service and productivity. Store fronts ,offices, conference rooms, information kiosks, hotel business centers, and schools will all benefit from having the extra peace of mind and protection that the iPad 2 Security Base offers. The new iPad 2 Security Base is very similar in design to the Apple store display; while providing additional security features including security brackets with Torx tamper-proof screws, mounting holes located within the base and 3M clear pressure sensitive adhesive for hard surfaces where screw holes are not an option. Unlike the Apple store, newMacgadgets version allows removal of the iPad 2 with the included Torx t-10 bit. Constructed from 1 ¼” clear acrylic the Security Base provides an elegant and substantial look that enhances the performance of the iPad 2 while securing it. 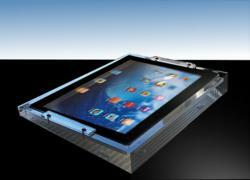 Each Security Base is custom milled and hand polished giving the iPad 2 an elegant and functional look. Slots are also provided within the Base for the charging cord and earphones. The new Security Base compliments newMacgadgets existing line of iPad 2 Display Bases. Prices range from $64.95 to $89.95 depending on model. Make sure to visit http://www.newMacgadgets.com for additional details and to view all of their current product offerings.